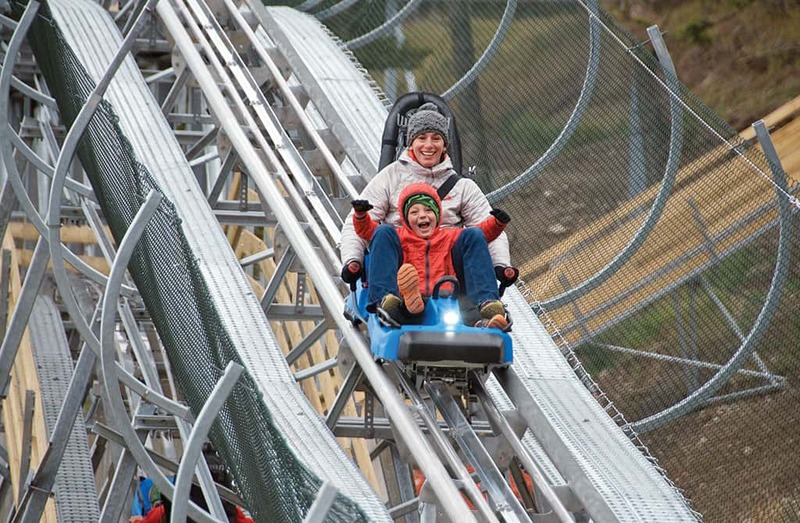 The state’s first Alpine Coaster opens at Snow King Mountain. I’M A GUINEA pig on Snow King Mountain Resort’s new mountain Cowboy Coaster, riding it almost immediately after it opens at the in-town ski hill this fall. I apprehensively load the cart-sled hybrid and give the attendant an enthusiastic thumbs-up. With that simple gesture, magnets mounted on the tubular stainless steel system tug me forward and up the ride’s 370 vertical feet. Snow King Mountain, the first ski area in the state of Wyoming, had lost some of its luster in recent decades as its lifts aged and other ski resorts morphed into year-round destinations. This winter, though, skiers and snowboarders enjoy a revamped Rafferty lift: the double chair is now a fixed-grip quad that extends a couple hundred feet higher up the mountain. Earlier, the Treetop Adventure Park—a ropes-type obstacle course in the trees above what are ski slopes in winter and hiking and biking trails in summer—was completed. And then came the Cowboy Coaster, Wyoming’s first mountain coaster, which opened in early October. It takes only a few minutes to get to the top of the coaster. Excited to test the promised high speed of 27 mph, I push my cart’s controls forward, effectively throwing the throttle wide open. Riders don’t have to go max speed; every rider can control his or her own pace, and there is anti-collision technology that prevents speedsters from slamming into the coaster carts of slower riders in front of them. My coaster expectation is of a toned-down kiddie experience, and almost immediately, the Cowboy shows me I’m wrong. Flying out of the first turn, speed and gravity already anchor me to the back of my seat, but, seeing a corkscrew coming, I brace further. I’d rather do that than check the cart’s speed. Going through the second turn, it has my full attention, and my vocal cords. What else can you do when so exhilarated other than scream? About five minutes after I first sit in the cart, I’m back at the bottom, laughing and reveling in the fact that I have a ticket for a second ride. The idea of installing a mountain coaster at Snow King was controversial; a major concern was its noise. If my reaction—hollering and laughing loudly—is any indication, it might not be noise from the coaster that locals need to worry about but the roar of happy riders. The country’s first mountain coaster opened in Glenwood Springs, Colorado, in 2005. Since then, nearly two dozen more have been built, from Park City, Utah, to the continent’s longest (the descent is just over one mile) at Berkshire East Mountain Resort in Charlemont, Massachusetts. Compared to other coasters around the country, the Cowboy Coaster is above average in terms of speed, length, and exhilaration. After climbing 370 vertical feet straight and steady from the resort’s base, it winds and loops its way down nearly two-thirds of a mile through a thick pine forest. The trees occasionally open to yield views of the Tetons, town, and the National Elk Refuge, but, going full speed, I’ll admit my attention wasn’t focused on the scenery.